Chain link fences were first developed in England in the 1840’s. They have been used in the U.S. for over 100 years, due to their longevity and low-cost, which still remains true today. The most popular chain link fences selected for residential use are zinc-coated (galvanized) steel or vinyl coated steel. Vinyl coated chain link fabric comes in a variety of colors including black, brown, white, green, and red. 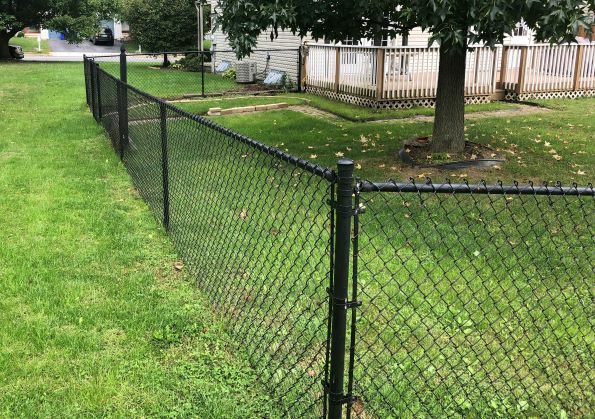 Chain link fence framework is the structure of the fence, made up of posts and rails, and can be ordered to match whichever color chain link fabric is selected. Galvanized chain link framework for residential use often uses 20 weight pipe while galvanized fabric is often 9 gauge. Vinyl coated chain link fabric is of a lesser gauge steel core (being 13 gauge) with a vinyl coating to make up the rest of the width. Both galvanized and vinyl coated fabric has a hole-opening of 2”, although other sizes are available. Pool code chain link fabric requires a hole-opening of 1.75”. Bottom Rail or coil wire- By adding bottom rail or coil wire to your chain link fence, you can increase its strength dramatically. We especially recommend bottom rail for dogs that are diggers or that continually push through the bottoms of fences. Coil wire is a less expensive option for adding strength to the bottom of your fence but has a slight give. Privacy slats- Privacy slats can give 75% to 100% more privacy to your chain link fence, and come in a variety of colors and patterns. Thank you for an awesome job! We very much appreciated that whole experience. Your installers were so professional and efficient. We were impressed with the work ethics and quality of work done. I would like to have you pass this on to them. Many of my neighbors were also impressed. Thanks again for the fence! We love it!! It looks great! Thanks for everything! 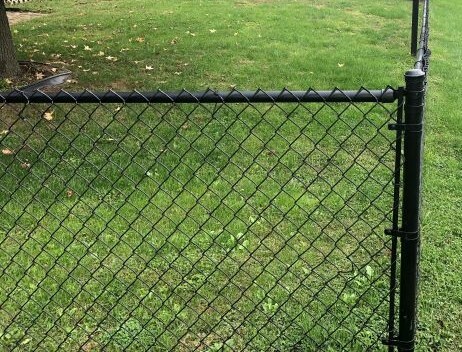 On behalf of the Trinity Congregation, myself and the property board I would like to extend a heartfelt thank you for the installation of the chain link fence around the entrance. A number of parents have expressed to me the peace of mind the protection allows them to have while waiting for their children after school. Again thank you for your generous donation. Thank you for sending Matt and Ken to remove my fence. They are not only very hard workers, they are very polite to customers! The fence looks great, we are glad we decided to have you remove the sod and used the Pocono stone! To everyone at AKA, We just love the fence!! Thanks so much for a job well done. The work crew on both Friday and Saturday were GREAT!! Very professional, accommodating and consulted with me as the job progressed. Thanks. Thanks for the great looking fence install!! You guys went over and above and it was really appreciated! You guys did a great job with everything from taking posts out to putting new ones in to putting gates in place to digging/placing dirt out of the way. Every day you all kept everything cleaned up. You all had a great sense of humor and you had everything under control. We are very grateful for all the work that you have done- It looks GREAT! We are extremely happy with our new fence. Brad and his crew were very professional from start to finish. They did excellent work and paid close attention to detail and perfection. They also honored my request to do their best to work around the plants on both sides of the fence. The plants are fine and the fence is beautiful. Thank you. We loved our fence! We are now moving at the end of the month and are asking them to do our new fence at our new home! Very nice workers! Not a single negative thing to say about AKA Fencing. My parents, best friend and my Aunt all used AKA after our fence was installed! My parents in Hamburg are extremely satisfied with their new fence and by the promptness and professionalism of this company! Thank you for doing such a nice job. Our fence looks wonderful. We are really happy with our end product. All the workers were great. We are enjoying our new larger fenced backyard. Service was excellent! Could not find fault with any aspect of the project or those involved getting the job completed. Great Job, quality work & project! Keep up the great work! Please bring an advertisement plate to hang on my fence so anyone who recognizes quality work will be able to contact your business for service. We had another wonderful experience with AKA thanks to Brad and his great staff. The fence looks great. We will continue to recommend AKA to our family, neighbors, and friends! I have been a customer of AKA Fence for many years. Their customer service is outstanding and their product is great!